Donald Trump was elected in part by tapping into the fears of a white culture which is projected to cede majority status by 2040. This along with rapid changes in the economy and shifts in social norms left many feeling dislocated. Mr. Trump seized upon the fear by creating scape goats. With broad strokes he identified Mexicans as ‘pouring over our borders’ and sending ‘rapists, murderers and drug dealers’. He’s called for a national registry of Muslims and a halt to accepting immigrants and refugees from Islamic countries. Of the 11 million undocumented immigrants in our country, he’s called for mass deportation. In Nov. 2015 he called for a ‘Mass Deportation Force’ to deport or incarcerate those deemed to be illegal. In November 2016 he set a policy within his first 100 days in office, to begin deporting 2 – 3 million undocumented neighbors with police records. The result will be families and communities torn apart. By making undocumented neighbors and refugees our collective enemy, Mr. Trump can divert attention from underlying issues that confront us: A globalized economy, environmental stewardship, inequality of: wealth, education and health care. How are faith communities responding to such fear based rhetoric? Many of my fellow Christians have embraced Trump’s message. Evangelical leader Franklin Graham (son of Billy) has gone so far as to say that ‘Donald Trump’s election is of God’. The church I serve, First Baptist in Beverly,(https://www.fbcbeverly.org) takes such passages to heart. We’ve chosen to reject fear and embrace those whom others would cast aside. 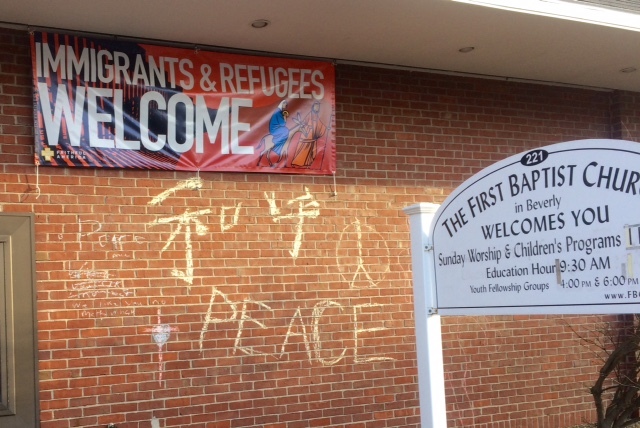 This Christmas season we’ve placed a banner by our entrance: Immigrants & Refugees Welcome. This banner is our response to the anti-immigrant/refugee/Muslim rhetoric that has coarsened our public life. Inspired by the Christmas story in Matthew 2:13-23 we remember that Mary and Joseph were homeless when Jesus was born. That the Holy Family fled persecution by King Herod and found refuge in Egypt. Today untold millions are seeking refuge from violence, violence, misery. Minority groups within our own nation feel under threat. How can we not offer welcome? We don’t know how the next few years will unfold. But we do know that we are guided by an ancient story that has captured our hearts, expanded our imagination and graced us with courage. Courage to say ‘yes’ to love and ‘no’ to fear. Christmas is coming yet again. Hope reigns. Praise God!